Pay attention to Tom Slee; he’s snide, but he’s spot-on. 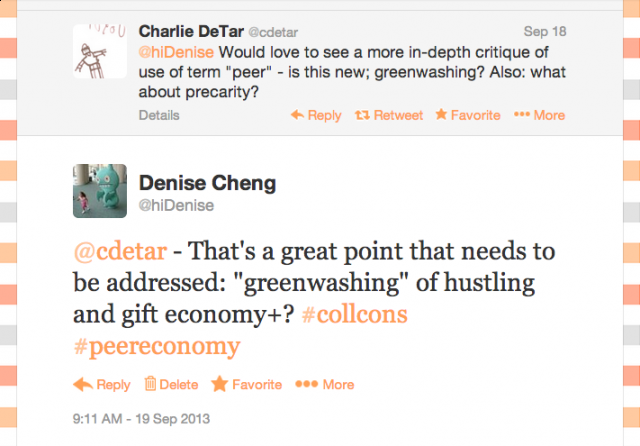 In a recent blog post, he neatly sums up how peer economy proponents appear to advocate selectively for its place in the formal economy. When should the sharing economy be treated as part of the real economy, and when should it not? Are you confused? Here is a short guide for the perplexed. when a site’s design enables racial discrimination on the part of its users. I agree with Tom, but I don’t despair at his criticisms. Media portrayal is its own battleground with its own politics. We need his criticisms—as well as peer economy proponents—to ensure that every angle is visible in public. But for those who want to translate insights into action, these criticisms are road signs to what needs to be done next. If you were in search of a labor advocacy agenda for the peer economy, Tom just gift wrapped one for you.